With International Women’s Day fast approaching, we wanted to let you know what we’re planning on doing to celebrate the day. 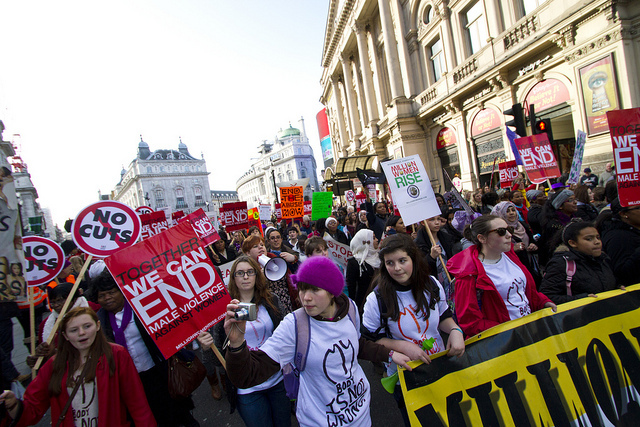 Since 2008, women have been taking to the streets of London in their thousands to protest global violence against women and express their hope for a safer world at the Million Women Rise march. This year, CFN will be attending the march, on Saturday March 9th, as a group and will be holding a prayer breakfast and banner-making session beforehand. We’ll be meeting at the Cathedral Offices at Southwark Cathedral from 9:30am. Bring along any banner-making supplies you have such as marker pens, fabric, and decorative bits and pieces. There will also be the opportunity to make a voluntary donation towards breakfast (a vegetarian option will be available). The march sets off from Oxford Street at 1pm, assembling from midday, so we will aim to leave the cathedral by this point. It will move along Oxford Street, which will be closed to traffic, ending in a rally at Trafalgar Square from 3pm. Although all are welcome at our pre-march event, only women and children are allowed on the march itself. Men can offer their support from the sidelines, however! If at all possible please let us know if you are hoping to attend by emailing cfnet@ymail.com. We have created a Facebook event here and an invitation in PDF format for you to circulate or print off. Find out more about Million Women Rise.